Citation Information: J Clin Invest. 2007;117(12):3800-3809. https://doi.org/10.1172/JCI32369. In addition to its well-known expression in the germline and in cells of certain cancers, telomerase activity is induced in lung fibrosis, although its role in this process is unknown. To identify the pathogenetic importance of telomerase in lung fibrosis, we examined the effects of telomerase reverse transcriptase (TERT) deficiency in a murine model of pulmonary injury. 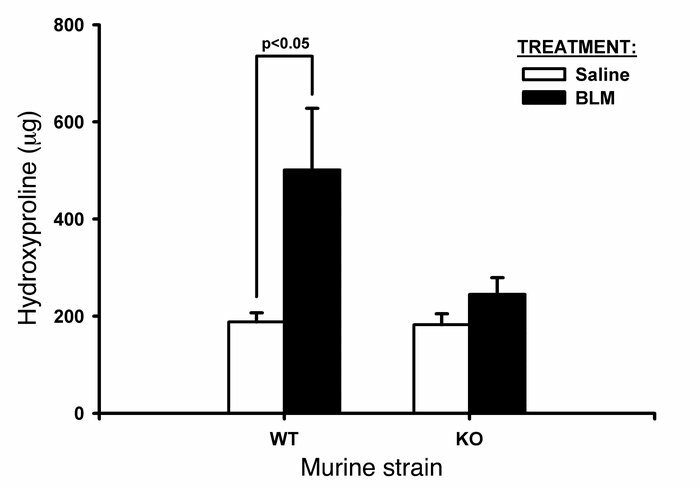 TERT-deficient mice showed significantly reduced lung fibrosis following bleomycin (BLM) insult. This was accompanied by a significant reduction in expression of lung α-SMA, a marker of myofibroblast differentiation. Furthermore, lung fibroblasts isolated from BLM-treated TERT-deficient mice showed significantly decreased proliferation and increased apoptosis rates compared with cells isolated from control mice. Transplantation of WT BM into TERT-deficient mice restored BLM-induced lung telomerase activity and fibrosis to WT levels. Conversely, transplantation of BM from TERT-deficient mice into WT recipients resulted in reduced telomerase activity and fibrosis. These findings suggest that induction of telomerase in injured lungs may be caused by BM-derived cells, which appear to play an important role in pulmonary fibrosis. Moreover, TERT induction is associated with increased survival of lung fibroblasts, which favors the development of fibrosis instead of injury resolution. Effects of BLM treatment on lung HYP content. Whole-lung homog­enates from the indicated strains were collected at day 21 after BLM or saline administration as indicated. Results (mean ± SEM) are expressed as μg per lung. n = 5 per group.